 People who race through the rolling countryside of East Flanders, making their way over the cobble stones and through picturesque villages, feel the cycling history that has been written here. Somewhere between these scenic views, one has to visit Geraardsbergen. 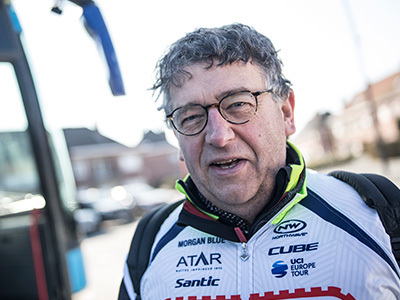 There you will find The Muur of Geraardsbergen, and at the edge of the village the home of a monument to Flemish cycling: Wanty-Gobert team leader Hilaire Van der Schueren (71). 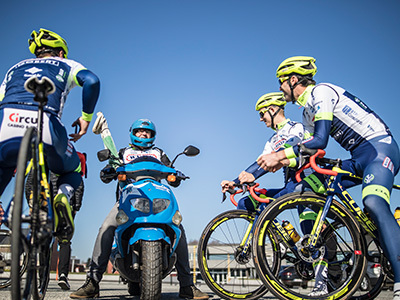 Today we follow this Pro Continental cycling team during the reconnaissance of the Omloop Het Nieuwsblad spring classic. The young riders gather on this sun-drenched day at the house of Van der Schueren and are welcomed by the team leader and his wife, Betty. She runs the kitchen and prepares treats and coffee for everybody. I might be old-fashioned, but I don’t stand still. I feel 40. Wanty-Gobert is a special team. ”We are a family team.” And that atmosphere is there. 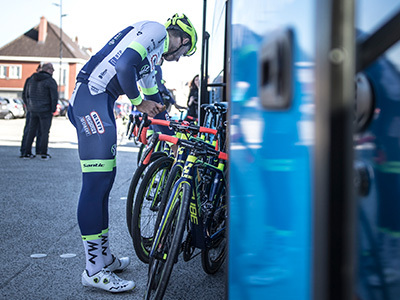 The spring classic returned to the Muur of Geraardsbergen. The organization decided De Omloop needed change. The focus in the final now lies on the iconic duo Muur of Geraardsbergen-Bosberg. The wheels of the big blue team bus get in motion, three cars are packed with supplies, team members and the press follow them. They make their way through narrow streets quickly and with ease. One wonders how this is possible at this speed in this cozy part of Van der Schueren’s hometown. The answer follows soon in the form of a man on a Wanty-blue scooter who stops traffic with his arms spread wide until the caravan has passed. His scooter has stickers of the team, he is wearing a Wanty shirt. A matching helmet compliments his outfit. He has, tied to his handlebar with an elastic band, a folded flag between his legs. His name is Luc, Luc Spandoek. He is the mascot. In the meantime, Luc races by again on his blue race monster. Up to the next crossing. At the beginning of the reconnaissance, the team exits the bus in all their glory. Everyone is wearing the newest BBB glasses, the Commander, which they received today. The team has put on their Icarus helmets, Spandoek Luc takes his off. Under all the Wanty embellishments, a middle-aged man appears: Luc van Steenberge. “A quick catch-up with the team members.” He has been following the team for years, and ever since his fellow villager Van der Schueren has led the team, he has been promoted to mascot. They really are a lot better than what I’m used. It’s nice to have a big visor and they’re incredibly light. The yellow signs of the organization lead us through Belgian villages where it seems like time has stood still. The same goes for the roads. Each village means a new cobbled section. Somewhere between the meadows south of Gent, the caravan stops. “Where are those waffles? 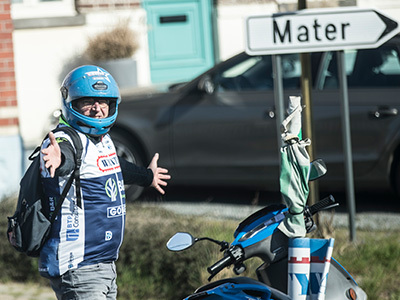 !” Rider Frederik Backaert lets air out of his tires, while team members walk by with waffles and new drinking bottles. At the first restroom break and team meeting, the 6 bar in the tires of most riders seems still too much. After receiving their snacks, Backaert takes off his Commander glasses. It’s the first time he’s worn these glasses. “They really are a lot better than what I’m used. It’s nice to have a big visor and they’re incredibly light." With half a waffle in his mouth, he gets back on his bike. The familiar “Let’s go!” of the team leader has sounded. This continues for the full 120 kilometers of the reconnaissance. Until the final. There, riders attack and everybody tries to give it a go, just before the hardest part of this reconnaissance: the Muur of Geraardsbergen. The climb of this cobbled road on the Oudenberg consist of short stretches with a rise of nearly 20 percent. Nice, but in the first place, it’s the cobbles, the aesthetics, and the wonderful chapel at the top that make this climb a monument for the Flemish people. The cobbles are placed kind of like shark teeth, and that makes them an unpredictable trap that can only be survived at high speed. Everybody races up at a quick pace. It’s like the guys can smell Betty’s spaghetti already. This is standard practice at the preparation for the first classic. The lady of the house, who used to run a restaurant, serves a three-course meal in the Van der Schueren youth center, soup, followed by spaghetti Bolognese and freshly baked rice flan. Nobody is short of anything. Cycling and the farm life, those worlds are so amazing... I am a happy man. Van der Schueren is nowhere in sight. When he sits down to a plate of pasta, he tells us about his other passion. “When I’m not busy with cycling, I work on the farm. I have twenty beef cattle and a piece of land.” Blue and white are the colors of Wanty, the Belgian Blue is the breed of cow he has on his farm, a couple of kilometers down the road.